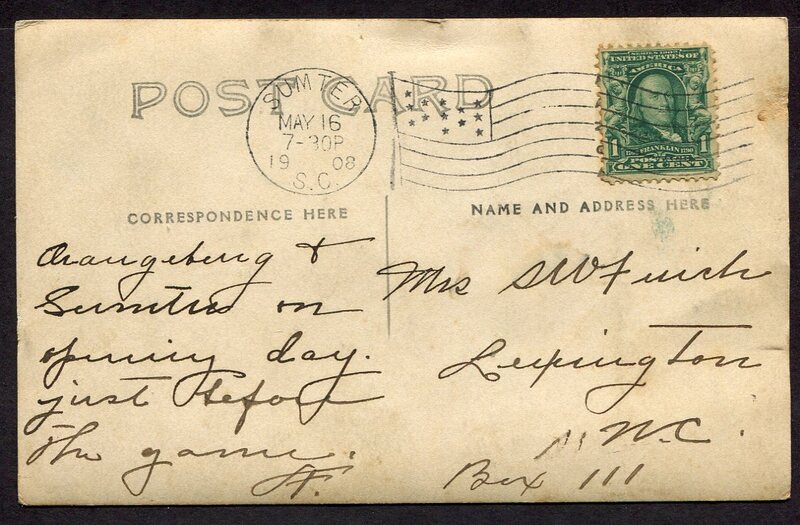 1908 Sumter South Carolina Gamecocks Real Photo Postcard. 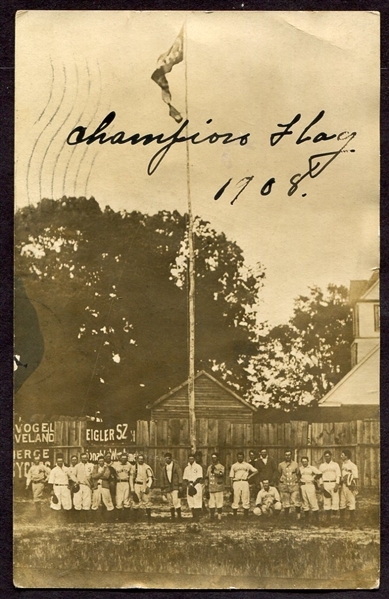 The team is seen raising the Pennant for their championship 1907 season. The Gamecocks played the Orangeburg Edistoes, both teams of the South Carolina League, standing below the flag pole. The Gamecocks only played the 1907 and 1908 season before being disbanded. A scarce image of a short-lived team. A few of their players were: Fred Springs, centerfield; John W. Cowell, pitcher; Pat Murrow, first base; Buster Sorrell, third base; Len Stephens, catcher. Front row: C. A. Long, pitcher; Sam Richardson, pitcher; Felix A. Dingle, short stop and manager; Billy Winn, second base; Billy Hauser, pitcher and Steve Moran, first base among others. Powell should be noticed as the player on the T209 Color set, a few of the others appear on T209 and T210's as well. © 2015 BROCKELMAN AUCTIONS. All rights reserved.